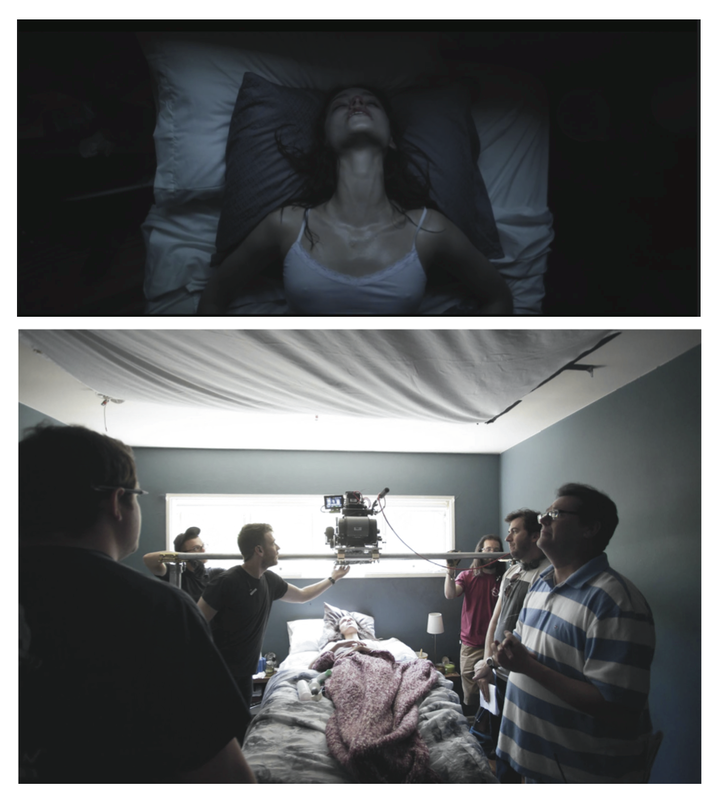 (Top) A frame from Starry Eyes. (Bottom) The behind the scenes set-up needed to create that frame. Crew members pictured are, from left to right: Best Boy Electric Christopher Faulkner, 1st AC Charlie Panian, actress Alex Essoe, Key Grip Adam Goral, Director Dennis Widmyer and 1st AD Dave Casper. Anyone considering relocating to Los Angeles to pursue the vagabond life of the thespian should first check out the Faustian cautionary tale Starry Eyes. The lovechild of early Cronenberg and Polanski, conceived to the sounds of John Carpenter and Goblin, Starry Eyes unfolds in an L.A. of sickly greens and despondent grays. That palette comes courtesy of cinematographer Adam Bricker, who spoke to Deep Fried Movies about his work on the film. The Plot: Wannabe actress and current Big Taters waitress Sarah (Alex Essoe) goes to extreme measures to land a part in a horror film from a once-prominent studio. Tagline: Dreams require sacrifice…and so do they. Starry Eyes is currently available via Video On Demand before hitting home video on February 3rd. 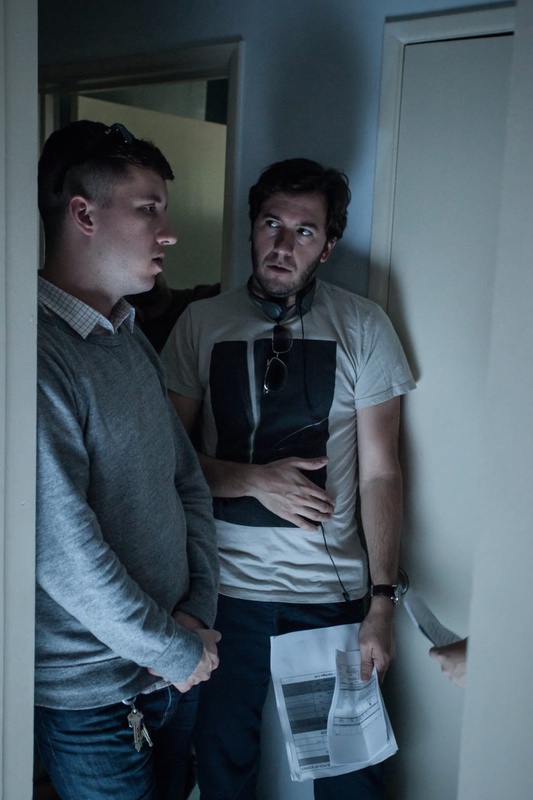 (Above) Director of Photography Adam Bricker (left) and director Dennis Widmyer (right). Let’s start by walking through your camera and lens package. Just prior to Starry Eyes, I’d wrapped production in Brooklyn on Dog Food, a narrative short thriller directed by Brian Crano. On that film, we’d captured some interesting looking footage with Tiffen low-contrast filtration. Dennis and Kevin loved the look of the short, so we decided to further experiment with the low-contrast filters on Starry. The filters cause the highlights to bleed into neighboring mid-tones and shadows, giving parts of the frame an imperfect, milky effect. It helped take the edge off the high-resolution sensor and crisp lenses. How did you use your B-cam? B-Camera was always working. I don’t recall us ever cross-shooting anything; almost all of our locations were quite tight spatially, which prohibited that type of approach. We usually had A, operated by my cousin Elie Smolkin, on a slightly wider frame and B, operated by Chloe Weaver, on the same axis shooting a tighter frame. We were tight on time, so having both cameras enabled some experimentation that wouldn’t have been possible otherwise. Dennis and Kevin might have a very specific composition on the shot list for A. Then Chloe on B would have the freedom to find a unique frame or different angle that perhaps Dennis, Kevin and I wouldn’t have thought of or prioritized in pre-production. Chloe captured great “bonus” footage with this approach. Alex Essoe, playing the lead role of Sarah, was simply phenomenal. It’s a demanding role and she would go intensely hard every single time. Shooting two cameras simultaneously reduced the amount of takes and setups, which I think helped Alex keep her energy high. We weren’t shooting a wide, relighting for the close-up, and then moving cameras forward and starting all over again. It was all happening simultaneously, in the moment. (Above) An Angenieux Optimo DP 16-42mm zoom lens – the type used on the A-Camera on Starry Eyes. With its overcast, ominous gray skies, Starry Eyes presents a nightmarish version of Los Angeles quite different from the typical palm trees and sunshine. A pickup day was scheduled to shoot establishing and various other texture pieces around Los Angeles and, to be honest, we got very lucky with some bad weather. It just so happened to be a gloomy, overcast day, which is rare for LA. We took full advantage of it and intentionally underexposed the image. Our colorist, Anthony Raffaele at Deluxe, New York, pushed the darkness even further in the DI. I love all of the ominous texture Anthony was able to bring out in the clouds. It’s unique and terrifying, not the typical look you would imagine for a day establishing shot of the Hollywood sign. Dennis and Kevin wanted to create their own version of LA for this story, and these establishing shots really help set the tone. Can you describe your overall approach to lighting the film? It’s a very dark movie thematically and it was important that the lighting and the look reflect that. We tried to shoot the film as naturally as possible; we wanted the darkness to feel authentic. And for me, that meant that the lighting needed to be motivated by real, believable sources. We go through everyday life with much of the light around us coming from directly above or slightly below us. There aren’t that many situations in the everyday world where you encounter a perfectly placed key light just above the eye-line. We took that philosophy and ran with it. Most scenes were lit by light bounced on or rigged to a ceiling, a covered wagon tossed on the ground, or a lamp placed on a bedside table. From a practical standpoint, this creative approach pushed us to light spaces so that they’d be shootable from 270 to 360 degrees. This gave our actors and our camera operators a lot of freedom. Were there any locations where adhering to those rules became difficult? We spent a lot of time wrapping our heads around the scenes set in true darkness. The “lit” scenes set in the evening during parties and whatnot are already super dark, how do we make the scenes set in the dead of night, after everyone’s gone to sleep even darker, but still visually interesting? There are so many scenes in Sarah’s apartment that take place in total darkness. Just figuring out how we were going to execute that look and stay true to that naturalism, that was a challenge. A lot of times the solution for those situations, especially in horror movies, is to push textured moonlight or street light through a window. Due to scheduling constraints, we shot the majority of the night scenes during the day. Plus, our shooting order was largely dictated by the evolution of Sarah’s makeup, a process that was quite involved. So, we were often jumping back and forth between a night scene and day scene. We quickly determined that the de-rigging and re-rigging of complicated black-out tenting and exterior lighting wouldn’t be an efficient use of our time. I worked with gaffer Zack Savitz, key grip Adam Goral and best boy electric Christopher Faulkner to design an overhead nighttime ambient lighting setup. They drilled a broad base of 4-foot 5600K Kino Flo fluorescent light bulbs into the ceilings. They then stretched thick muslin rags across the entire ceiling and over the bulbs to heavily diffuse the light. The edges of the muslin were skirted with black Duvetyne fabric to reduce the amount of light hitting the walls. The lights were pre-rigged, so we could flick on the Kino tubes, black out the windows, and transition into shooting a night scene. We were all thrilled with the results. The soft top-light feels directionless in camera. It gives the “lights off” look a cool bluish nighttime ambience that I think feels more real than a shaft of moonlight would have. Most of the violence in the film is contained within a single setpiece in which Sarah turns on her friends. You handle that violence in a very blunt, non-stylized way. What’s happening on the screen is so brutal and terrifying, you definitely don’t want to get in the way of that. We stayed true to the way we shot the entire movie. The cameras were handheld and in close proximity to Sarah on wider and medium lenses. It feels very real, it’s close-quarters, it’s dark, and it’s absolutely terrifying. The VFX/Make-Up department did a killer job. The scene where Sarah slices Erin’s face (Fabianne Therese), it just looks amazing. There was such an insane amount of blood in that kitchen. It was all over the floors, all over the camera operators. I think Elie (A-Camera operator) was wearing a poncho just to navigate the amount of blood. 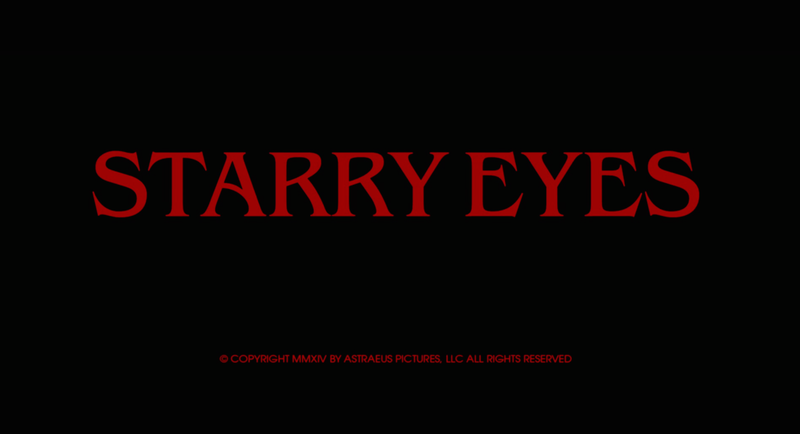 Adam walks us through a few shots from Starry Eyes. 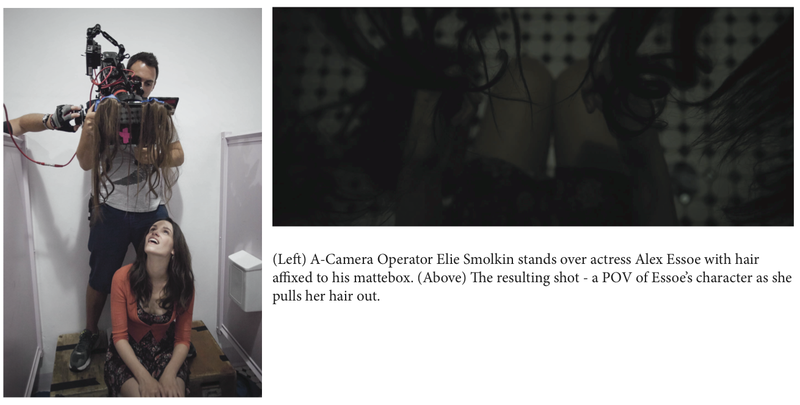 The first dolly or slider shot in the film comes during one of Sarah’s auditions, in which she grabs the attention of the filmmakers by pulling her own hair out in an act of self-flagellation. Shooting handheld throughout provided opportunities to highlight certain key moments with a dolly move, a slider push or even a simple static shot on sticks. As you’re drawn into the movie you sort of forget about the handheld operating and then that sudden stillness really jars you. Kevin and Dennis used that as a tool to draw attention to important moments, this being one of them. It’s a turning point in the plot. Sarah’s boss (played by Cheap Thrills’ Pat Healy) gives her a talk about what it means to work at the Hooters-style eatery Big Taters. The lighting for Carl’s (Pat Healy’s) office was simple and similar to our approach in Sarah’s bedroom. We rigged a few Kino-Flos above Carl’s desk. Our key grip Adam Goral softened the light with diffusion and then shaped it a bit with black. The light was tinted with plus-green gel to give his office a subtly slimy, fluorescent feel. Anthony (colorist) timed the green of the fluorescents in the office to match the green of the fluorescents in the subway station (scenes). I like little details like that. It all comes together to create a world. Sarah meets with a film producer with nefarious designs on her, an unsettling scene that is bathed in the warmest, most inviting light in the film. The warm light is so at odds with the rest of the film. The scene is a trap for Sarah, so we wanted it to feel eerily inviting. Zack (gaffer) and Chris (best boy electric) rigged 8 to 10 medium china balls in a circular pattern in the center of the ceiling, and Adam (key grip) softened the light with muslin. We used that as a base and practical office lamps for a few highlights in frame. The top-down lighting creates soft shadows on the character’s faces. It’s both romantic and spooky. Lou (Louis Dezseran, who plays The Producer) has this great bronze skin tone that played really well with the warm light. I love how he contrasts with Sarah’s porcelain complexion. After an audition gone awry, Sarah pulls out her hair in a bathroom stall in this POV shot. This shot is definitely the brainchild of Dennis and Kevin. I believe we executed it with Elie (A-camera operator) standing above and behind Alex on the toilet seat so that you can see her legs in the background. We had some hair extensions from the art department in the foreground, which were attached directly to the mattebox. A little unorthodox, but I think it turned out to be a very effective shot. Alex Essoe makes a fateful phone call. This scene sums up much of what we’ve been talking about. As we anticipate the ring, we break from handheld and cut to a push-in on the phone. There’s an interesting tight profile angle from three-quarters behind Sarah, it’s just the right amount of creepy. Chloe captured that frame with B-camera and it’s one of those “bonus” compositions that we likely wouldn’t have been able to capture without the flexibility of two cameras. From a lighting standpoint, we’re using a few Kino bulbs from the pre-rigged overhead ambience setup. The coolness of the ambience is contrasted in color with a warm up-light motivated by the desk lamp. The angle of Zack’s (gaffer) key light is very low and moody, but it’s grounded in reality, so you totally buy it. Sarah’s just gotten out of the swimming pool, and I love how the low-angle, warm light shimmers on her wet skin. Really enjoyed this interview, Very informative. I will be linking to it in an article I am just finishing up on Starry Eyes as well. Great job!